Whether you are off to a month-long trip overseas or a weekend vacation out of town, you’ll need a good suitcase to pack your belongings. The last thing any traveler wants is to see clothes, souvenirs and personal belongings scattered all over the baggage carousel. When an opportunity for travel comes, many of us treat luggage as an afterthought. It’s no wonder that most of us have never mastered the art of packing our bulky belongings to fit in a small suitcase. Check out some of the best luggage options for senior citizens. Each rising day, airlines and travel agencies are charging more fees for checked luggage, necessitating the need to pack belongings to even smaller packs arise. Checked bags come in both soft and hard shell cases. For frequent travelers, carry-on luggage is something you should put much consideration into before purchase. You don’t just need any suitcase to pack your stuff. No! You need more than that – something that goes beyond simple looks. A quality suitcase with impeccable design, TSA-friendly locking systems, spacious main compartments and one which adheres to airline luggage rules is what you require. With the numerous options available out there, you’ll be spoilt for choice. If you are in the market for some new travel luggage, we present to you, in no particular order, the best luggage options for 2019. 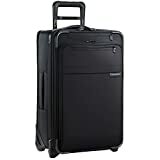 There’s a good reason why the Samsonite Omni Pc Hardside Sinner 20 is Amazon’s best selling luggage for business travel. This carry-on luggage comes with re-engineered lightweight spinner wheels offering incredible maneuverability and mobility. Its outer case contains micro diamond and a brushed exterior that is scratch resistant. It hides any created scratch and makes it look new even after numerous trips. On top of that, it has a full zip interior divider and cross straps whose aim is to increase the packing organization. The Samsonite Omni Pc Hardside Sinner 20 comes in more than 10 different colors. Business people prefer black ones while those on holiday vacations going for the brighter colored ones. It’s a suitcase that should be in your get list. If you are in search of hard luggage that can take a beating, the CALPAK Winton’ Expandable Luggage Set is the option for you. What you’ll love about this carry-on luggage is that it comes in two; carry-on luggage suited for short getaways and a large 27” luggage for extended holidays. In addition, it is lightweight despite being hard, and contains a large compartment that can stretch up to 2 inches for additional packing space. This is thoughtful of the manufacturers who had heavy packers in mind. Also, extra security is guaranteed with this luggage as TSA mounted their approved combination locks on it. This allows for TSA Agents to open and inspect your luggage when need be. Lastly but not least, the luggage comes with 8 dual spinner wheels with an ability to rotate 360 degrees for smooth and effortless mobility. 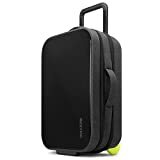 Another amazing luggage that appears in our list is the Incase Eo Travel Hardshell Roller. A unique feature about this suitcase is the butterfly design that opens flat and allows it to pass easily through airport security. Manufacturers of the suitcase had technology in mind and provided a pouch big enough to fit a 17″ laptop together with chargers, wires and hard drives. Its front panel is made of polycarbonate that is hard for enhanced durability and protection. If you are a business traveler who values form and functionality, we recommend the Incase Eo Travel Hardshell Roller for you. Classic and old school are the words that can be used to describe the Travelpro Maxlite 4 22” Expandable Rollaboard Suitcase. Measuring 23 inches long and 15 inches wide, the classy soft suitcase comes with a telescopic handle that could stretch up to 42.5 inches long to increase its length. Secondly, it has numerous zipped compartments that easen organization. Different clothing could have their own spaces. The front lid also comes with a relatively large space. Its ball bearing in-wheels come with protective crash guard housing wheels for protection. This allows traction through rough terrain without the fear of the wheels breaking. Finally, the suitcase possesses an expansion capability of 2 inches for additional storage. This suitcase is undeniably designed for maximum storage. For those travelers who have a lot to carry with them but limited space, this suitcase works best for you. Body Dimensions: 21.5x14.5x8. Overall Dimensions: 22.0" x 15.0" x 8.0"
The Samsonite Brand once again appears in our list with the amazing Samsonite Aspire XLite 21.5” Expandable suitcase. The polyester-made durable suitcase is made at a carry-on size suited for most airlines. This suitcase is attractive, has a hard shell and comes at an affordable price. It is light, durable and comes with two wheels and a deep pocket. Its handle is retractable; stretching out long to pull the suitcase and is stored neatly inside when not in use. Locks are available for both when extended and stored for security. Another feature of this suitcase is the inline skating wheels constructed with polyurethane. A fantastic offer comes from the company where shipping on all orders for this suitcase is free. Beauty with space is what the manufacturers had in mind when designing the Briggs and Riley Baseline Expandable Carry-On Suitcase. This suitcase closes our top luggage options for you. Made out of ballistic nylon fabric, the suitcase is resistant to wear and tear, water, dirt, and abrasion. On top of that, it comes with a hybrid fiberglass frame which provides long life and flexibility to the suitcase. The interior room of the suitcase is quite spacey and makes the suitcase suitable for long trips where a lot of luggage is required. The wheels of the suitcase are sturdy and will remain so even after numerous trips up and down the staircase. The pressure of the stairs is something not many suitcase wheels can withstand. Well, not the Brigs and Riley Baseline Expandable Carry-On. It was created purposefully for this. 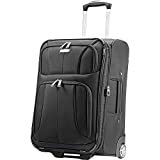 We considered different factors when deciding the best suitcases and carry-on luggage from the various ones available – material, durability, zips, and locks (whether they are TSA Approved), handles and wheels. With tight competition in the luggage industry, manufacturers consider quality and functionality to provide their customers with the best. All the suitcases mentioned above are available in Amazon.com for purchase and shipping. They come at affordable prices and won’t create a huge dent in your pocket. Grab your ideal suitcase today! Learn about the best medical alert devices for senior citizens.